DISCLAIMER: This post will have uncensored spoilers! Read at your own peril! 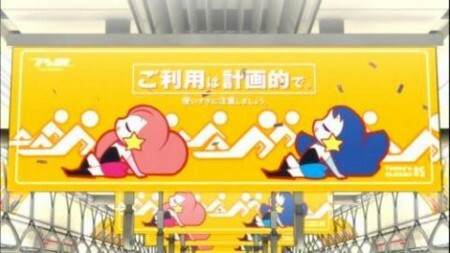 So I went through my second rewatch of Penguindrum, and wow, I noticed a -LOT- of references to things that seemed to be lost in translation. I’m pretty sure it is common enough knowledge here on these forums that the Shadow Girls in Utena are the lens by which Ikuhara intends the viewer to watch the show. I believe the same formula is happening with the Slogan of the Day messages we see on the train. And if things are being lost in translation, English viewers are alienated by the lack of a shared cultural knowledge. I wanted a space where I could let my observations about the train slogans to be known, and so as not to loose focus, this thread is going to be dedicated solely to the train sequences of the show. Many of these are pretty self explanatory, but as the show progresses...well...some of them not so much. This is a work in progress, so I’m going to edit this post as many times as I need to as I go back through the show to revisit and expand on my commentary. And if you didn't take the hit above, there will be uncensored spoilers. This is your last warning! Okay? This is a pun, because it could also be read as “STOP Curry Smell”. lit. Preplan your usage. Be careful to not overuse. Commentary: We’re finally getting into the cultural references. This is an advisory that plays with Japanese credit card commercials. More specifically, it is a reference to the iconic Takefuji CM. Just compare the poses! The words are an advisory to borrow money from the credit card company responsibly. I don’t have much to say about it’s connection to this episode yet (need to rewatch), but here is just a thought, perhaps the song Synchronized Love by Joe Rinoie is actually what is important here. lit. Watch your step! Your feet will hurt! Don’t give up on your dreams! Dream [hit] ball. lit. A single word can kill. lit. That is a story that took place before I was born. lit. Going is good, but returning is scary. This is an old nursery rhyme from Japan called Tooryanse. It is a traditional singing game similar to London Bridge is Falling Down. The object is to not be caught when the song is over. The figures on the advertisement seem to be playing this game.